Arrival at Belo Horizonte and depart to Ouro Preto. On the way, visit the historical city of Sabara (25km from Belo Horizonte), where the gold was first found in Minas Gerais. Its remarkable artistic heritage is a good example of early baroque. Visit the "Capela de Nossa Senhora de O (a chapel), Igreja Nossa Senhora do Carmo, Museum of Gold and the theater. Continue to Ouro Preto for overnight. Today visit the most important historical city of Minas Gerais - Ouro Preto which got from UNESCO the title of Cultural Heritage of Humanity, being also part of Brazil´s Circuit of Gold. Ouro Preto also has the most valuable collection of the baroque art, the biggest homogeneous complex of Brazilian's baroque architecture and the biggest complex of baroque in the world. Our next destination is the enchanted city of Mariana, founded in 1696 which was for a short time the capital of the State of Minas. A walk down the picturesque streets allows you to see houses which date from the beginning of the XVIII century, with their balconies of wood, iron and even soapstone. Return to Ouro Preto for Overnight. Morning departure for a full day tour and transfer to Tiradentes. On the way we will visit the city of Congonhas, where we will find the masterpieces of Master Antonio Francisco Lisboa, known just as Master ALEIJADINHO (the little cripple) - the twelve Prophets, carved in soapstone and his sculptural representation of the Via Crucis (Stations of the Cross), done in polychromatic woodwork. His works in wood and stone were the "trademark" that decidedly defined the Brazilian Baroque style. The set of life-sized sculptures is Brazil's greatest artistic treasure. After that we will continue our journey and visit Sao Joao del Rey, close to Tiradentes (about 14km distant). 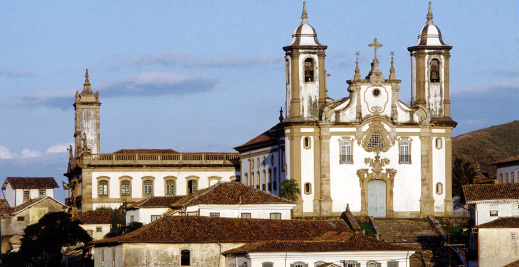 Sao Joao del Rey is a city from the "golden era", combining modern and colonial. During the tour you will visit the Church of Sao Francisco de Assis, Regional Art Museum, Carmo Church, Rosario and Cadeia bridges. From Friday to Sunday is also possible to travel from São João del Rey to Tiradentes in an old and charming train (steam locomotives) in the same style as the people of the XIX century used to travel between these two cities (not included in rate).Continue to the charming historical city of Tiradentes (about 20km). The city has its name because of our first martyred hero - Joaquim Jose da Silva Xavier, nicknamed Tiradentes . Comfort, sophistication and style make Tiradentes one of the most alluring towns in Minas. Its shops are inviting, the craftworks of the finest quality, the inns and restaurants enchanting.After lunch (not included in rate) visit the Church of Santo Antonio, Rosario Church, Colonial fountain and the Museum. In Tiradentes, overnight at selected pousada. Day at leisure to get to know this charming city. Great shopping and nice restaurants. Overnight at selected pousada. At appropriate time transfer back to Confins Airport.